Hidden on the outskirts of Castiglion Fiorentino, in the eastern corner of Tuscany is the tiny farm of Marco Tanganelli. Marco is first and foremost an agriculturalist, garnering a regional reputation as the best source of advice when it comes to tending vines. 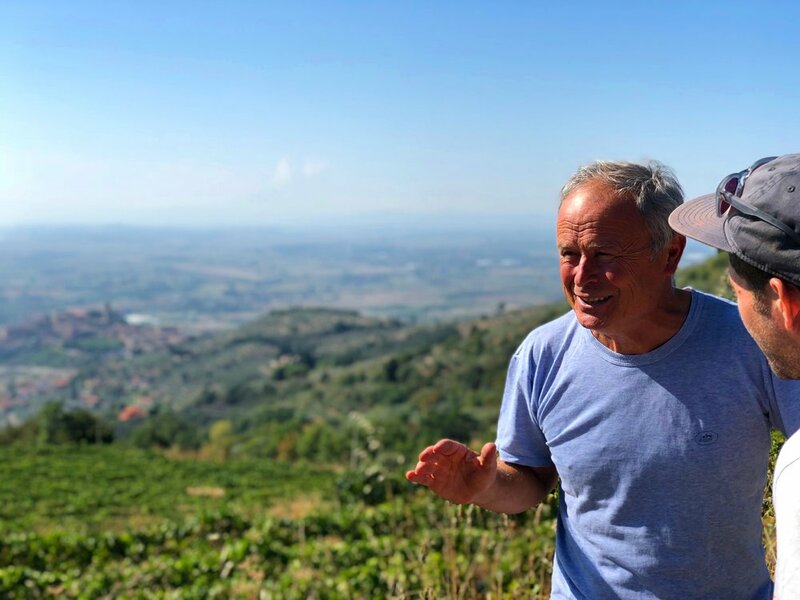 Carlo Tanganelli, Marco's father, established an agricultural nursery over 40 years ago in order to preserve and propagate the local grape, olive and orchard varieties. The Tanganelli family always made wine, mostly for themselves and locals but didn't start to bottle and sell their wine until the late 90's. Today Marco farms some 5 hectares of very old trebbiano, malvasia and sangiovese vines, with some new plantings being made in the past few years on some high altitude terraces far above the village. Marco's wines are made in the mold of the old-school Tuscan peasant style wines, yet they show the care and skill of a true craftsman. Natural fermentations, long elevage and zero or minimal sulfur are paramount methods of Tanganelli. Two of the white wines, Anatrino and Anatraso both come from one very old vineyard that's about 3 hectares in size. It is believed, both by Marco and the University of Siena, that these are the oldest parcels of trebbiano and malvasia in Tuscany; many vines are nearly 110 years old and the entire plot has never been touched by chemicals or pesticides...a rare find anywhere in Tuscany or Italy for that matter. Trebbiano Toscano. Direct Press. Aged in stainless steel. 100% Trebbiano Toscano. Hand-harvested in October. Spontaneous fermentation with 4 days skin contact. 7 months in stainless steel. 90% old vine Trebbiano Toscano, 10% old vine Malvasia del Chianti. Spontaneous fermentation with 3 weeks skin contact. Aged in tonneau for 18 months. 100% Sangiovese. Spontaneous fermenation with 25 days skin maceration. Aged partly in stainless steel, and partly in barrel for one year. 100% Sangiovese from Mammi vineyard. 40-45 days skin maceration followed by long aging in Botti Grandi, then a year in bottle. Only produced in excellent vintages.